Someone once told me, true genius is humble. He could have easily been talking about Professor Lucio San Pedro — Philippine National Artist awardee of 1991, esteemed composer of classic choral works such as “Sa Ugoy Ng Duyan” and “Simbang-Gabi,” and retired music professor — because the maestro is devoid of airs. At 86 years old (“And still going strong” he assures me), he has simplified his life to a daily routine of composing, reading the Bible and then sleeping. He is a congenial, family man, choosing to stay in his hometown of Angono, Rizal instead of the bustling city. And yet, flowing through this man’s veins is music that will be remembered decades hence as the truly original Filipino music, because it renders the Filipino experience in melodies and harmonies that pulse with life. He ushers me into his cozy music den where the walls are covered in plaques, awards and images of the Virgin Mary, and every available surface contains trophies or music pieces. Where his rustic piano holds a work-in-progress (an a capella Latin mass for the Madrigal Singers, I later discover) as evidenced by the music sheets and various pens on the ivory keys. Atop the piano are images of the Sto. Nino and again, the Virgin Mary. This is a blessed workspace, that much is obvious. And when he begins to answer my questions with his entertaining stories, I listen like a churchgoer to a homilist who makes sense. CHANNELS: WHAT KEEPS YOU BUSY THESE DAYS? LUCIO SAN PEDRO: This Latin mass (for the UP Madrigal Singers) is keeping me busy in spite of the fact that we are having so much construction here. (Portions of his home are being renovated noisily, as we speak.) Of course there is no deadline, but I want to rush that because there are so many compositions that I have to write again. And that is the result of being a retired music professor with nothing to do except compose. C: YOU’RE NOT TEACHING ANYMORE? LSP: Frankly, the last time I taught was in St. Scholastica’s college of music. And I said to the sister there, you will excuse me because my students have graduated already and I think this is my time to rest and rest, and do nothing but compose and compose. C: HOW LONG HAVE YOU BEEN TEACHING MUSIC? LSP: Since 1942. Then the war broke out, the University of the Philippines (U.P.) was closed. But off and on, I went to private colleges during the war years. After the war, I was offered a scholarship in 1948 for the Julliard School of Music, in New York. I stayed there for one year — just to broaden my mind in composition. And then I returned to the Philippines and taught in different colleges: St. Scholastica’s, Philippine Women’s University, St. Paul’s College. I didn’t go to U.P. right away. I returned to U.P. in 1972. Upon reaching the age of 65 eh talagang you have to retire, ano? One week pa lang, sinasabi na sa akin: “You better prepare your credentials and records, you’re going to be driven out of U.P.” (laughing) That was in 1979. Off and on, the Cultural Center has been commissioning me. Like during the Centennial, I was commissioned to write a big choral composition for baritone solo and orchestra, also the Centennial march for military and civilian bands. Yun na lang yung mga activities ko in the last few months. C: HOW DID YOUR LOVE FOR MUSIC START? LSP: During my primary years here in Angono and my intermediate years in Pasig, I was involved in jazz music. I was playing banjo and guitar with famous jazz groups like the Ilio Orchestra and the Molina Orchestra. We played in cabarets — just to make some kind of living. Because we are a poor family. And you wouldn’t believe I had to bribe the janitors in our Conservatory of Music so I could sleep there after my engagements. Mga alas-dos, alas-tres, I had to wake them up by knocking on the door, “Open Sesame!” But I gave them a sandwich of some kind. I never thought of really taking music as a course at first. I was not bad in English when I was in high school, but mathematics, algebra, geometry, that was beyond me. So I could not take engineering. My father was a civil engineer, but he was also a musician. By force of circumstance, I was forced to take up music even if my desire was law or medicine — something like that. Full scholarship ako sa Conservatory of Music hanggang graduation. I proved to my father that really, I belonged to music. My course, which should have taken 8 years, I took in only 5 years. And that was two major degrees: conducting and composition. I graduated with the two degrees in 1938. C: TELL US ABOUT YOUR COMPOSITIONS. LSP: I have written a lot already orchestrally, choral, instrumental and band music. As a matter of fact, my violin concerto which was performed only last year at the CCP, I composed that in New York. And I have a symphonic poem and overtures. But most of my works were performed by choral groups like the Madrigal Singers or the UP Concert Chorus. I remember, when they were still touring abroad, Rey Paguio asked me to give him my big work, that is “Sa Dalampasigan” which is for chorus, orchestra and baritone solo. C: WHEN DO YOU COMPOSE? DO YOU HAVE A DAILY SCHEDULE? LSP: Composing? Every day, day in and day out, even in the evening. I rest at 12 midnight. Then I read the bible up to 2 or 3 in the morning. Kaya ang aking pagtulog siguro mga 3 or 4 hours only. That’s my routine. C: DO YOU FEEL ENOUGH IS BEING DONE IN OUR COUNTRY TO PROMOTE FILIPINO MUSIC AND THE ARTS? LSP: That is my woe. Because dito sa atin, nabubuyo ang mga tao, lalo na ang kabataan sa pop music. Which I regret. Pagkat nawawala ang essence ng ating pagka-Filipino. This is my personal opinion. Yun nga ang sinasabi ko sa studyante ko sa composition: “Why are you imitating these people? They create their own music and then you imitate? You cannot be greater than the creators.” We have to start from the bottom, have a strong foundation in music then eventually we go up. But we can’t start from atop. Kaya mayroon tayong mga avant garde na iyan, mga music na di maintindihan. Madali gawin iyan. You can bang your hands on the piano and call that music. Why do it? Simply because you want to project your modern concept of what music is? People who are listening to your music will not understand, so what’s the use? If I will create something, kinakailangan na it is something that people will understand, absorb and appreciate. Hindi ko sinasabing kailangan nating gawin ang katulad ng mga ginawa ni Beethoven at Mozart. No. The past is the past. Although I have the classical compositions of these people, kinakailangan ang akin naman– sa kasalukuyan — this is what I am going to produce. Hindi na yung kanilang iyon. C: SO YOUR PHILOSOPHY IN COMPOSING IS …WHAT? LSP: “Creative Nationalism.” That’s my philosophy now. Why? I will give you the history. Ginawa ko yun sa aking “Lahing Kayumanggi.” I used one measure of “Bahay Kubo.” And squeezed the juice out of it. Imagine more than 500 measures from the first measure of Bahay Kubo. Without using modern pop music and modern singers — wala, purely Filipino. And that is what I mean by Creative Nationalism: I recreate our folk songs not in its entirety but fragmentarily. Something taken from the roots, mula sa ating lupang tinubuan. Ganoon din sina Beethoven, sina Wagner sa Germany, si Tchaikovsky sa Russia. Ang kanilang bansa ang kanilang ipinagdidiwang. Eh bakit tayo ginagaya natin ang mga Amerikano? Away with this kind of pop music. C: SO YOU FEEL OUR POP MUSIC RIGHT NOW IS NOT FILIPINO ENOUGH? LSP: Yes , it’s not really Filipino. But it’s very good, no question about that. 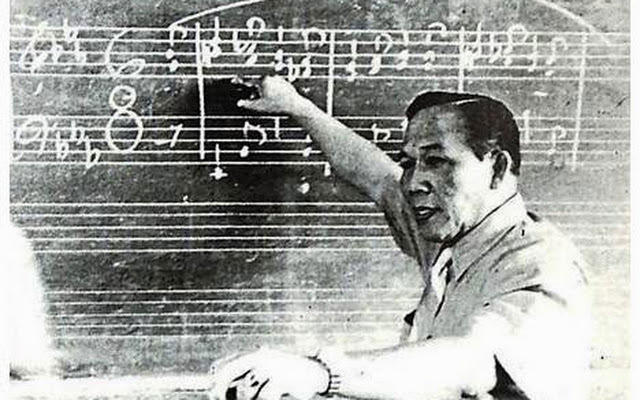 Kaya sayang ang talents ng mga composers. Kung halimbawa nagkaroon sila ng diwang Filipino, and propagated it? Ang bansa natin ay makikilala talaga. I don’t think foreigners will appreciate this kind of pop music because it is not ours! Ito ang sinasabi ko sa aking mga lectures: Our folk songs are like sugarcane. Squeeze it and the juice comes out. From that juice we can get molasses, brown and white sugar, etc. Maraming klaseng by-products ang pwedeng manggaling sa sugarcane. Ganoon din ang musika. “Leron Leron Sinta” o “Bahay Kubo,” maski Igorot o Muslim music, atin lahat iyan. Why can’t we squeeze the juice out of this music and transform it into symphonic form? We can do it. Ang aking mga kaibigan sa UP, we are members of the League of Filipino Composers. And if you ask these members what, to them, is Filipino music, you will have different answers. You have to taste whether it is really Filipino music. If it is distasteful, there is something wrong. I don’t want to say that my philosophy on what Filipino music is, everyone must accept. No, it is my own. But let us see if it will survive the test of time. Stamp photo from Philippine Post website.